Valentine’s Day is two Mondays away. This means you have about two weeks of procrastination and/or shopping until Sunday, the 13th hits and you’re forced to buy something lame from Sears. Solution: Win this very limited edition iPad Dodocase from us. That way you can either spend more cash on that evening’s festivities or buy Dead Space 2. You’re call. We’re just here to hand out prizes. Of course you can save yourself some agony and simply buy the case, although Dodocase is only going to make 40 of them and they’ll probably go fast even at $75. Just like their other iPad cases, this one is hand-made from San Francisco artisans trained in the art of book binding. 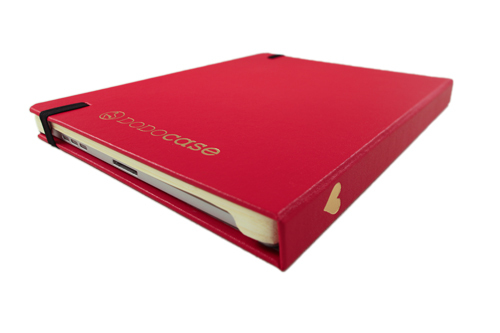 Greg even professed in his Dodocase review that “this case could probably get you laid” which may or may not carry over to this edition that features a lovely golden heart on its spine. Click through for the instructions and rules. Contest is open until February 2nd, 2011 at 11:59pm PST.